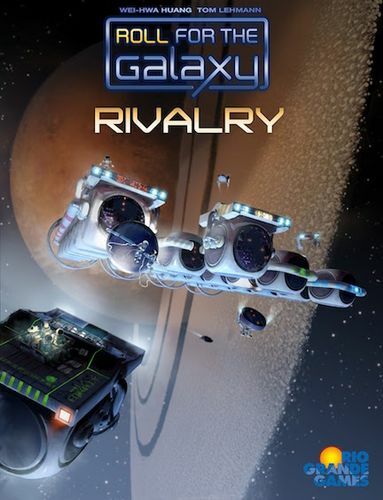 Rivalry is the second expansion for Roll for the Galaxy. In many ways, however, Rivalry is three complementary expansions in a single box. First, Rivalry adds more variety to the base game, with a new die type, factions, start worlds, and new game tiles. Second, Rivalry adds an optional Deal Game in which players who assign dealers to the deal phase can trade virtually anything for anything, depending on which Deal die faces are showing. Figuring out what you can temporarily "loan out" from your empire to gain other items to kickstart your growth adds new considerations and strategic depth to the game. 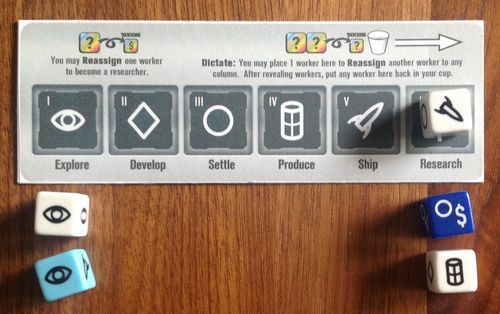 Third, Rivalry adds an optional Alien Orb Game in which players each get a customizable die whose faces can be upgraded by assigning researchers to the research phase. This adds a whole new "tech tree" to enhance the standard Roll actions. Plus, dice crafting is fun! 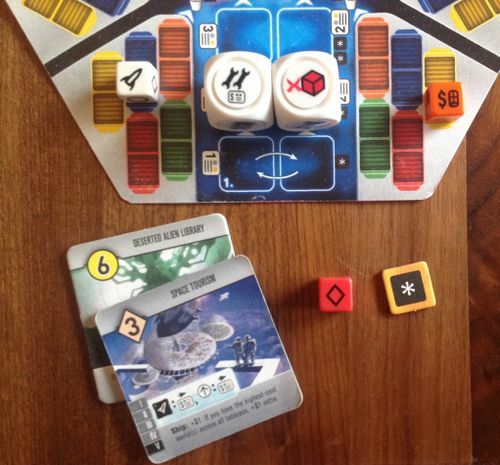 The new Pioneer die (dark blue with white symbols) strongly supports Settle, strengthening colonization strategies. 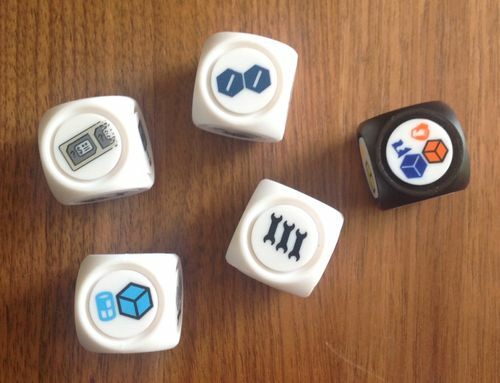 Pioneer dice, like Novelty dice, match novelty worlds as goods or shippers, enhancing Produce-Consume strategies. Rivalry is fully compatible with, but does not require, Ambition, the first Roll expansion. Rivalry adds eight new factions and ten start worlds to add more set-up variety to the base game. Many of these feature the new Pioneer die or the Entrepreneur die introduced in Ambition. 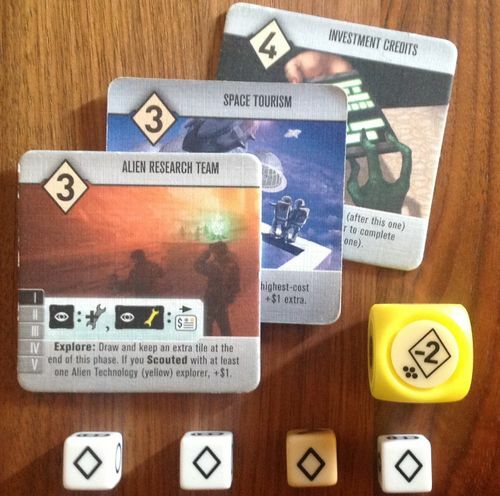 Rivalry also adds thirteen unique game tiles to the bag (compared to just five in Ambition), including several worlds that score variable victory points. Thematically, many tiles include various "forecast" and "prediction" powers, a homage to Issac Asimov's classic Foundation stories. As an "Easter Egg", one other tile's artwork also pays tribute to the series. Many years ago, Tom considered adding deals to Race for the Galaxy. The idea was to allow players to trade cards with each other, allowing both players to benefit. Tom developed, and Wei-Hwa tested, several versions before we decided it just didn't fit Race's aesthetic. What Wei-Hwa found fascinating was how its "win-win" deal approach simulated trade on a large scale (say, between countries). It is common for individuals to think of a deal as a zero-sum game in which making a deal with another person results in one side "winning" and the other side "losing". In reality, both sides win when a deal is voluntary — even if you don't get as much benefit as the other side, you'll get some benefit, or you wouldn't have made the deal in the first place! The idea of increasing player interaction in Roll in a "win-win" way — as opposed to how many other games handle player interaction with attacks or competition for limited resources — was attractive to Wei-Hwa. 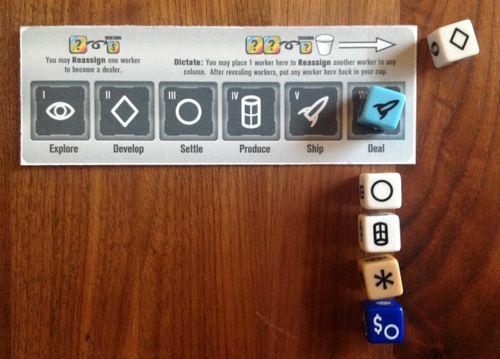 Unlike Race, where almost everything in the game is represented by cards, Roll has many different items owned by players — dice, money, tiles, etc. — to trade. Further, these items have varying values based on their location; for example, tiles in your construction zone are different from tiles in your tableau. 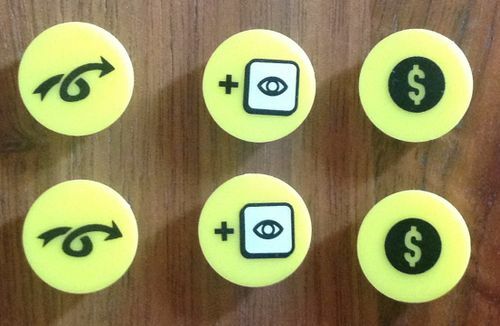 These ideas were in Wei-Hwa's mind during Ambition's design, so even though the Deal game didn't exist yet, the "$" symbol on the newly-introduced Leader and Entrepreneur dice were designed with the idea of possibly adding a new phase later (where $ symbols would now match the $ phase instead of being worth +1 credit when modifying the other symbol on a $ face). 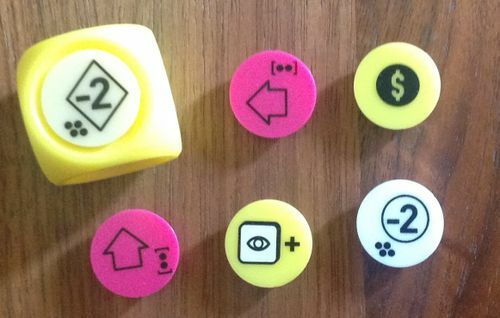 To make this new phase work in two-player games, Rivalry uses a Leader die as the "dummy" phase selector. To ensure that players without $ dice still have easy access to the Deal phase, we added a new Reassign power so that every player, by choosing the phase and using both Dictate and this power, can always assign at least three dealers to it. The original concept, where players made deals by trading items with each other during this new phase, failed. A completely open forum, with everything open to negotiation, slowed the game too much. The next step was to restrict what players would be allowed to trade. Wei-Hwa experimented with cards and tokens until realizing that wait, Roll is a dice game, so why not put the "dealable resources" on dice? This created a new problem: Players might be inclined to make a deal, but the timing would be off. Having the Deal dice reveal exactly the things players wanted to trade to each other, with both players rolling $ faces at the same time, wouldn't occur often enough for the Deal phase to be an integral part of the game. Having multiple "markets" where at any time there could be up to three deals in progress helped, but it wasn't enough. The solution was to make deal-making asynchronous. Instead of having two players make both sides of a deal at the same time, let the supply be a middleman holding assets traded away in a deal until another player "closes" that deal by adopting its other side. To encourage the closing of a deal, extra incentives "sweeten" the deal over time. These extra incentives for both players involved in a successful deal capture how large-scale trade creates increased opportunities for mutual benefit. This approach led to new issues: What happens if a deal doesn't get closed, even with extra incentives? Can a player do a deal multiple times? Can a player broker both sides of the same deal? Eventually we realized that these were actually features, not bugs. By creating a market, players often make more deals with the supply than they are making with each other. The same player can even reverse a deal that they made a few rounds earlier, pocketing the bonus for both sides and effectively loaning out their spare resources for more useful items and a future profit. Without setting out to do so, we had invented (a simple form of) credit-asset swaps. We reused the talent counters — flexible "one-shot" workers — from Ambition, making them the main reward for closing deals (as opposed to creating them). Adjusting the deal-closing incentives to give just the right amount to entice players to engage in the Deal phase (since, after all, most dice in the game don't have "$" faces) but not so much that the Deal phase dominates the original five phases was the final piece of the puzzle. For example, in the deal above, last round Blue traded away two tiles from their construction zone and 1 credit to obtain a Military die. Blue intended to reverse and close this deal two rounds later, returning the Military die — after using it twice — for 2 tile draws and 1 credit, plus 5 credits and 2 talent counters (i.e., the incentives on both sides shown above the current Deal dice position). However, this round, before this deal matures to the next position, Yellow calls Deal and closes this deal, spending 1 Military die for 2 tile draws and 1 credit, plus the closing side's incentive this round: 2 credits and 1 talent counter. Blue receives 2 credits, the creating side's incentive for this deal closing this round. Another issue was timing. Roll's style, inherited from Race, is to encourage simultaneous play as much as possible. 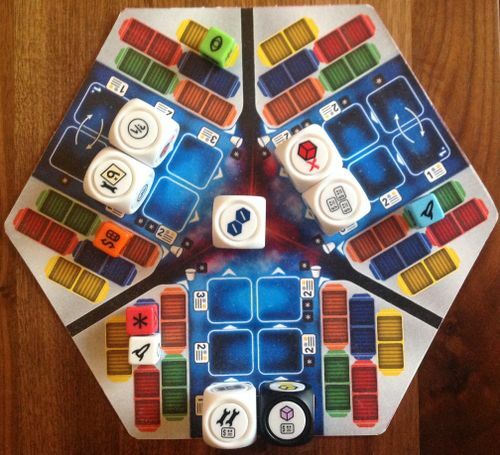 With a finite number of Deal dice, we needed a player order in creating deals, hence the Deal priority track. We experimented with allowing deal player order to be a deal item, but that was too complex. Instead, we push deal-creators to the bottom of the track, which means that if you pass on making deals for a while, you'll gain deal control for a future round. 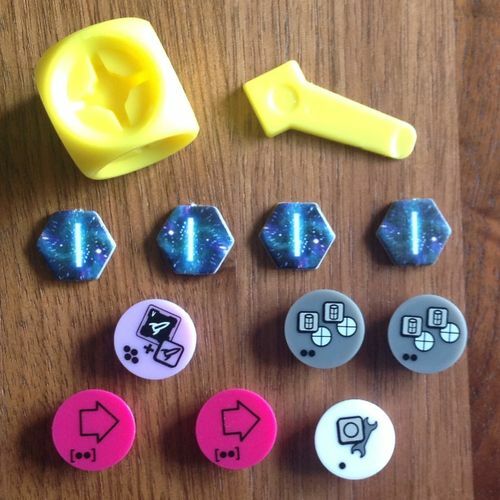 It was fun thinking of different items to put on the Deal dice faces. In addition to trading dice, money, and tiles, players can use deals to search for developments with a given keyword or worlds of a certain color or change how much money their treasury can hold. The challenge was that anything that could be given or gained had to be capable of being "reversed". For example, if we gave players the ability to give up tiles in their tableau, thereby affecting game tempo, we needed "generic" worlds and developments that could be gained as well. The Deal Game is a deeper, more interactive Roll experience that challenges players to identify what they don't need and to create deals that leverage these unused assets to gain items that will speed them to victory. 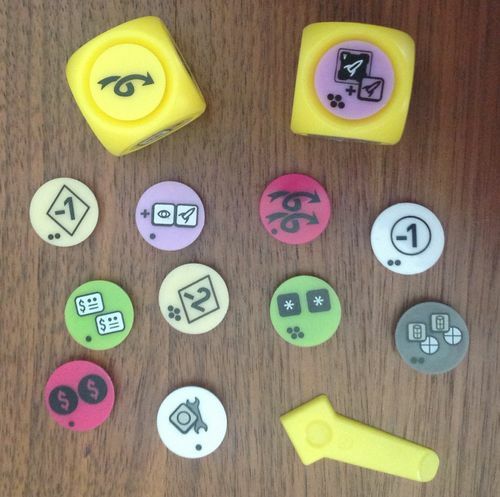 While developing the Deal Game, Wei-Hwa used prototyping dice with removable die faces to try out different deal faces and test how to distribute them among the various Deal dice. 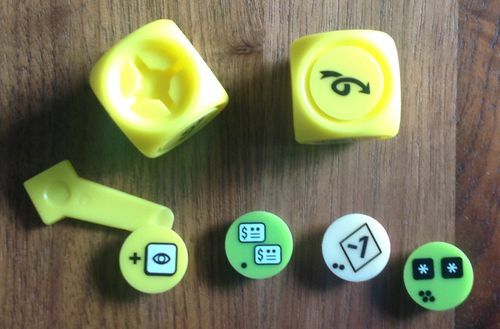 Tom saw them and wondered whether using customizable dice to create a "tech tree" for Roll for the Galaxy would be interesting. What if each player had an Alien orb die, representing unknown artifacts taken from the Alien Orb, that they could upgrade during play? Just as in the Deal game, the Orb Game uses $ faces and a sixth phase for Research. When someone calls Research, each assigned researcher does two "dots" of research: for one dot they can upgrade a die one level (from a starting face to a "1-dot" face); a second dot could upgrade that face to a "2-dot" face; and two more dots would upgrade that face to a "4-dot" top level face. The 4-dot faces are expensive and should provide large effects. Suppose one was -2 dev cost (min. one die) to all developments built that round? Rolling it would enable a player to potentially build a stack of developments all in one round. However, arranging to roll that face when you're ready for it is tricky. 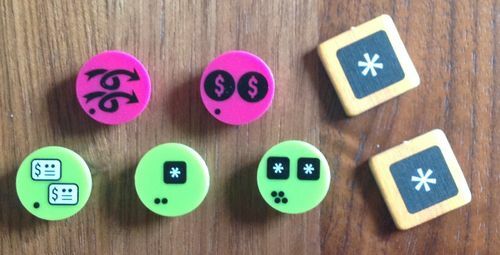 What if you could also invest in cheaper "arrow" faces, an idea introduced by Stephen Glenn in his customizable dice game Rattlebones? If you roll an arrow, you "follow" it to the die face it points to, turning the die. 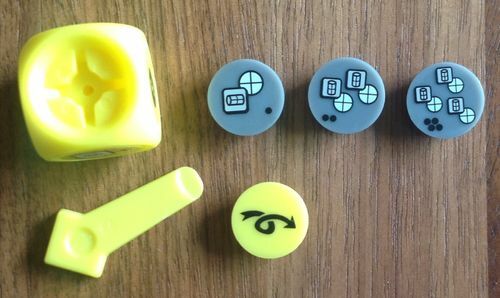 Slap two arrows and a 4-dot face on a die and that face is 50% likely to be rolled each round. Even better, what if after using a -2 dev face, you could cross-grade it to a new tech line, such as -2 Settle, that the arrow faces now lead to? That's pretty sweet. • Never assign any dice to research. • Do some early research for a more useful orb die. • Invest moderately in research. • Invest heavily in research. • Two virtual Explorer faces. If you roll them, will you call Explore? Will other players, seeing it, try to "leech" off your expected call? • Two upgrade faces that each improve orb faces 1 dot. Players who never assign researchers are now automatically involved in the orb game. • Two reassign faces to help players in the early game when players don't have many dice or reassign powers. Rolling in front of the screen also enabled Tom to tackle a "group think" issue that some players encounter. In Roll, Produce-Ship is most effective when you have an an implicit "partner" so that both phases are called in the same round. Doing Produce-Ship on your own over two rounds against several other players doing Explore-Develop strategies can be too slow. 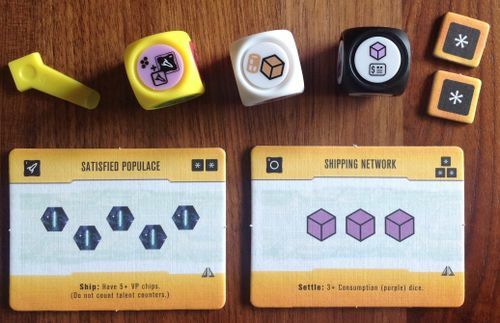 By having the top-level 4-dot Ship face result in Ship being automatically called (with all players knowing this), a player who rolls it can then call Produce and do an entire Produce-Ship cycle in one round. Adding several "utility" faces allowed players to successfully leverage a small amount of initial research. However, the moderate research strategy didn't initially pan out; players found it was better to either invest just a bit or a lot in research. By adding a tech that grants talent counters, which can enhance any Roll strategy, the moderate strategy worked. Players naturally pop out all their faces to score them, which makes resetting the orb dice for the next game easy. The Orb game now worked, except that it was too short; there wasn't enough time for the improved faces to have a big enough game effect. By extending the game's victory conditions to fifteen tiles in the tableau and the initial VP chip pool to 15 VPs/player, we addressed this issue. At this point, we were happy with Rivalry. It adds variety to the base game and extends ideas introduced in Ambition (new dice and talent counters), and its two optional games complement each other: The Deal game adds strategic depth, while the Orb game is more accessible and enhances existing Roll strategies. For the truly adventurous, the Deal and Orb games can be combined with each other and with the goals added in Ambition. We don't recommend this until players are quite experienced! The issue was cost. With over sixty Roll dice to support both the new tiles and the Deal Game, twelve customizable dice, over two hundred die faces, plus tiles, a deal mat, talent counters, credit slips, new phase strips and screens, and more, Rivalry is packed with components and comes in at $80 MRSP, more than the Roll base game! After we got the quote, Wei-Hwa, Tom, and Jay Tummelson, the head of Rio Grande Games, debated whether to break Rivalry into three expansions. However, separately these would cost $125 for players who wanted all three. 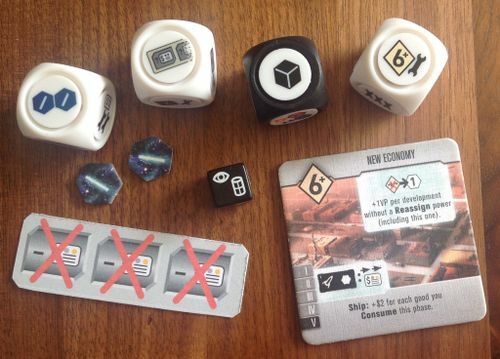 Without the Deal game's needed Leader dice, we wouldn't have them for just the tile expansion and would have to supply different rules for players with and without Ambition. Supplying the Deal and Orb games together lets them share components and rules (new phase strips, talent counters, etc.). By combining the various expansions, we could also produce a new unified player screen that works for all play modes (including Ambition), avoiding stickers. We decided that splitting up Rivalry just didn't make sense — we lost Rivalry's complementary nature without producing any cost savings for players who liked two of its parts and increased the cost for players who liked everything. We're vary happy with Roll and Rivalry. One of our goals with the various games in the Race universe (currently Race, Roll, Jump Drive, and New Frontiers) is to have each game feel and play differently, despite sharing a setting. 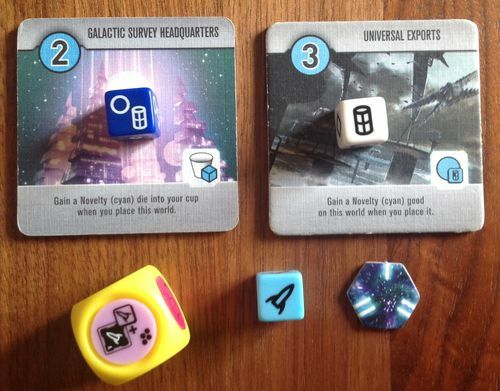 With Rivalry, we feel that we are making full use of Roll for a Galaxy being a dice game. 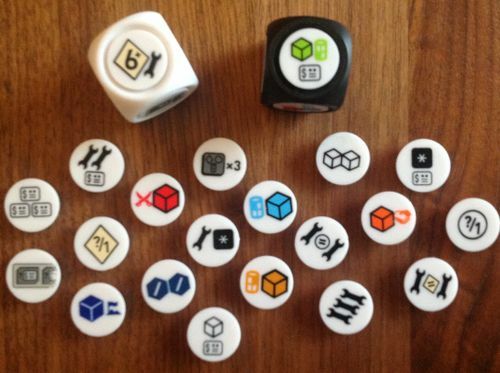 Dice are used in new ways to produce a constantly shifting selection of trade items in the Deal game and a "tech tree" to explore in the Orb Game. Enjoy!